The iconic covered bridge in historic downtown Long Grove is a symbol of our village around the globe. As of today, it is officially listed on the National Register of Historic Places. The National Park Service has announced today that the Buffalo Creek Bridge, more commonly known as the Long Grove Covered Bridge, is being placed on the National Register of Historic Places. This is the first property in Long Grove to receive this prestigious designation. Originally constructed in 1906 by the Joliet Bridge and Iron Company, the bridge is one of only two remaining of its kind in the greater Chicagoland area. Grass roots efforts for historic preservation and national recognition were rekindled early in 2017 when some local officials questioned the historic value of the one-lane bridge and favored a plan that would require removal of the current structure and increase truck and auto traffic through the pedestrian friendly downtown. In April of 2017, Landmarks Illinois, named the bridge to their annual “List of Endangered Historic Places.” A change.org petition urging local officials to save the historic bridge gathered over 4,900 signatures/testimonials and a fund-raising campaign has raised over $50,000 in monetary donations and pledges. Despite these efforts, local officials remain undecided on a long term course of action to restore or replace the bridge. “For many years, the Long Grove Historical Society has been at the forefront of efforts to receive this designation, and we are thrilled to hear the news. Achieving National Register status confirms our belief in the bridge’s historical value as well as the sentimental value we know it holds for our community. This is a source of pride for all of Long Grove and we will continue to advocate for preservation of our beloved covered bridge,” noted Historical Society President Angie Underwood. 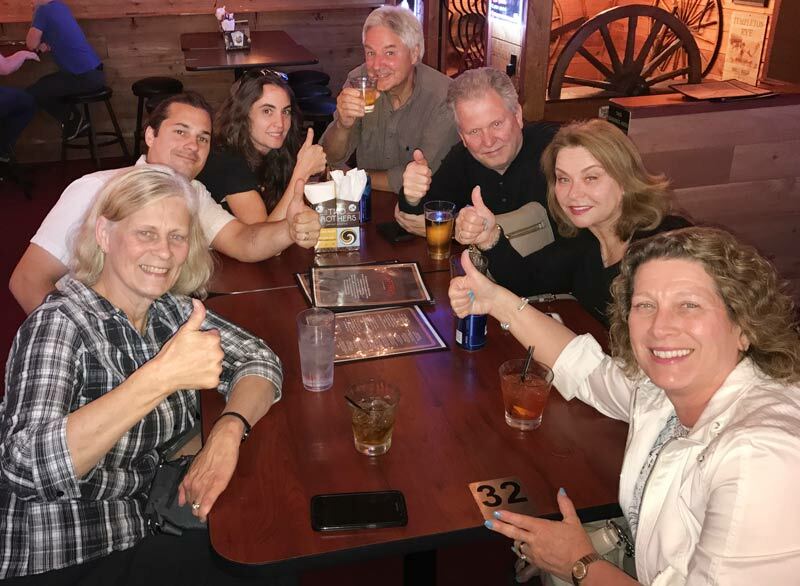 Members of the Long Grove Historical Society giving thumbs-up to the good news! Enjoying the talents of professional Puppeteer Krist Neumann is part of the fun to be had this weekend at Chocolate Fest in Long Grove! Festival season has returned to downtown Long Grove, with this weekend’s Chocolate Fest kicking off the fun and entertainment. Yesterday’s comfortable temperatures and calm skies made it a pleasure for those attending, and for the merchants who enjoyed the healthy crowds. It was the perfect evening to relax in the outdoor seating at Broken Earth Winery, share a bottle of merlot and a pizza from Joanie’s, and enjoy the festival people-watching. With Jodi Smith on the porch of Broken Earth Winery, soaking in the festival ambiance. Of course, you can’t attend Chocolate Fest and not sample a bit (or a bunch) of chocolate! Among the many tempting options were classics like fresh chocolate dipped strawberries, and clever new combinations like chocolate bourbon espresso ice cream. Yep, I can verify that both are worth the indulgence. And who can resist a signature Long Grove specialty, the apple cider donut, covered in chocolate and placed on a stick for maximum enjoyment and festival portability? Not me! As far as entertainment goes, there are carnival rides for the kids as well as free children’s activities on Towner Green. The Historical Society once again hosted a show on the back porch of our farmhouse featuring local youths and adults (and puppets!) in the family friendly production, “Chocolate, Chronicled.” Headlining bands round out the festival evenings and the street in front of the main stage at the covered bridge was packed last night with music lovers. Click below to view a snippet. Chocolate Fest continues today, May 20th until 5:00 pm in the historic downtown. 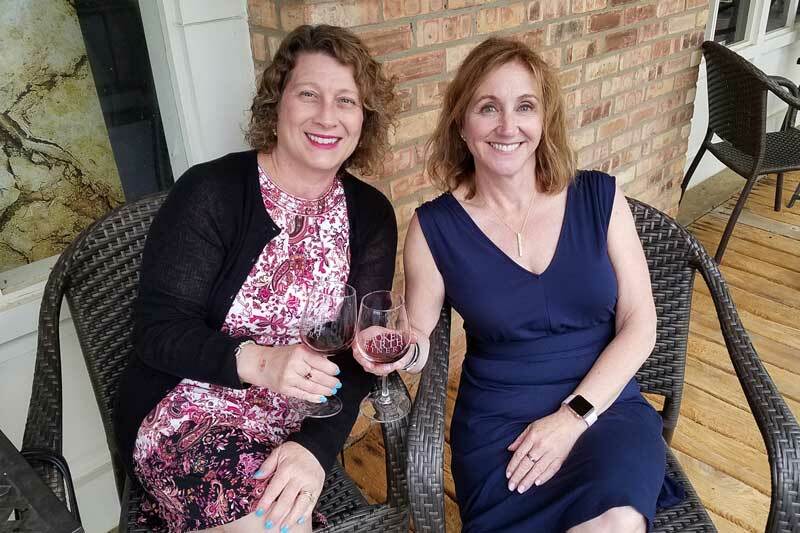 Long Grove boutique owners (L to R) Lynne Jankovec of Olivia’s and Mira Pinscher of Bella Donna looking stylish at the May 10, 2018 Fashion Show. Now that Spring weather has finally arrived in Long Grove, it’s time to shift those boots and heavy sweaters to the back of the closet and make way for sandals and sundresses. To help you with that, we have two stylish boutiques in Long Grove chock full of beautiful things to wear in the warm months ahead. And I know this for a fact, because I attended the recent Mother’s Day Fashion Show at the Grove Country Club put on by Lynne Jankovec of Olivia’s and Mira Pinscher of Bella Donna. This annual event has been held for the last five years and is always a really fun night out with the ladies while enjoying a preview of both the fashion forward and classic looks for the season. In addition, there was a bit of on-site shopping to enjoy and raffle prizes to bid on, with the proceeds going to support the fight against breast cancer. I was excited to find the perfect summery dress to take with me on vacation next month–and I’m still contemplating that matching hat! No matter where this summer takes you, be it afternoons in the park, lunch in the garden with your girlfriends, or a romantic sunset dinner on Santorini, Lynne and Mira can dress you in the perfect attire. This weekend is a great time to stop by, as Chocolate Fest returns to Long Grove on Friday, Saturday and Sunday May 18-20. Now that is a winning combination if there ever was one–new clothes AND chocolate! Ethel Berger (on the right) and I offered our congratulations to owner Craig Leva at the Grand Opening of the newly located Long Grove Confectionery. 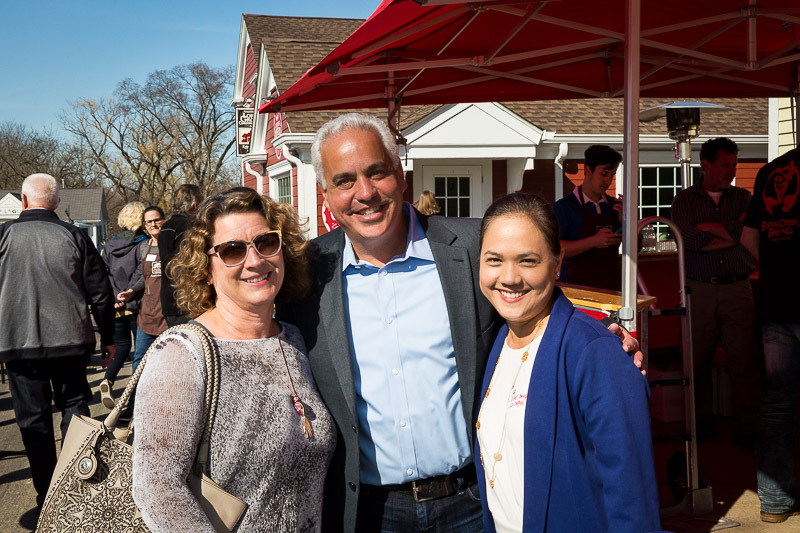 Smiles abounded on a perfect springtime evening last Friday for the Grand Opening celebration at the newly renovated Long Grove Confectionery. A year in the making, our town’s namesake sweet spot has happily settled in their new location alongside Towner Green, now offering much more than delicious chocolate creations. Besides locally famous Myrtles (recently named one of “Chicago’s Best” by WGN Channel 9!) you can now also purchase Long Grove Apple Haus favorites like apple cider donuts and Uncle Johnny’s brown bag apple pies. A demonstration kitchen is part of the new retail shop, where customers can watch strawberries and other treats being created and coated in luscious chocolate. The Confectionery expanded to include the next-door Long Grove Coffee Company, which opened this past December. Already a favorite gathering spot with the locals, it features occasional weekend live music and a patio for relaxing in the warmer months to come. A chef is now on staff to create soups and fresh bakery items and coming soon, signature sandwiches. The party was a lovely celebration of the culmination of 12 months worth of remodeling. It featured a live band, beautiful spread of appetizers, a chocolate fountain (of course!) and my favorite new discovery, apple pie pops. Several hundred people stopped by to offer Confectionery owner Craig Leva and his staff kudos on the beautiful new spaces. As a former elected official and resident who cares deeply about our Village, it warms my heart to see the investment being made by the Long Grove Confectionery in the future of our downtown. New stores and renovated spaces bring excitement and positive energy to all. And for this chocoholic, having our hometown Confectionery up and running bigger and better than ever makes me very, very happy! Maureen introduced me to a new indulgence–apple pie pops. Simply Scrumptious! Members of the community, Historical Society, and downtown Merchants Association gathered to hear a presentation on local history and welcome Harbor Chase to Long Grove. Earlier this year Long Grove’s newest Senior living community, Harbor Chase of Long Grove, held their grand opening celebration. 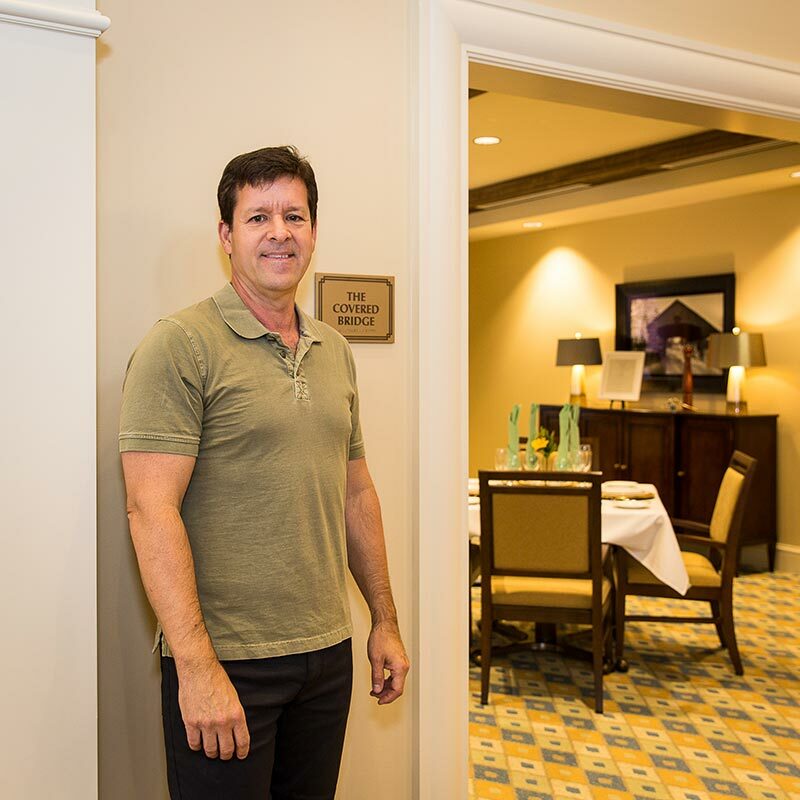 While I was unable to attend the big party, it was great to be invited for a personal tour and to speak at a luncheon this past week at the newly built assisted living and memory care facility. Enlisting the help of my husband Aaron (who writes for Long Grove Living magazine and loves to tell a story or two…) we gave an educational program on “The History and Architecture of Long Grove.” The Historical Society enjoyed partnering with our new neighbors at Harbor Chase to provide some community enrichment, and I hope this will be the first of many opportunities to work together. Everyone who attended the free luncheon was also given a full tour of the beautifully decorated facility. During my years on the Village Board I dealt with the many plans, renderings, approvals and resolutions needed to get this development underway. The end result is very elegant, with attention to detail and amenities like live music, beautiful flower arrangements, and homemade macaroons, not just on special occasions but as part of the everyday lifestyle. There is even a resident puppy to bring smiles and lively energy! Aaron Underwood stands next to the “Covered Bridge Room” at Harbor Chase. The “Crackerjack” lounge/bar area also pays homage to local history–it’s the name of Long Grove’s 1906 baseball team. 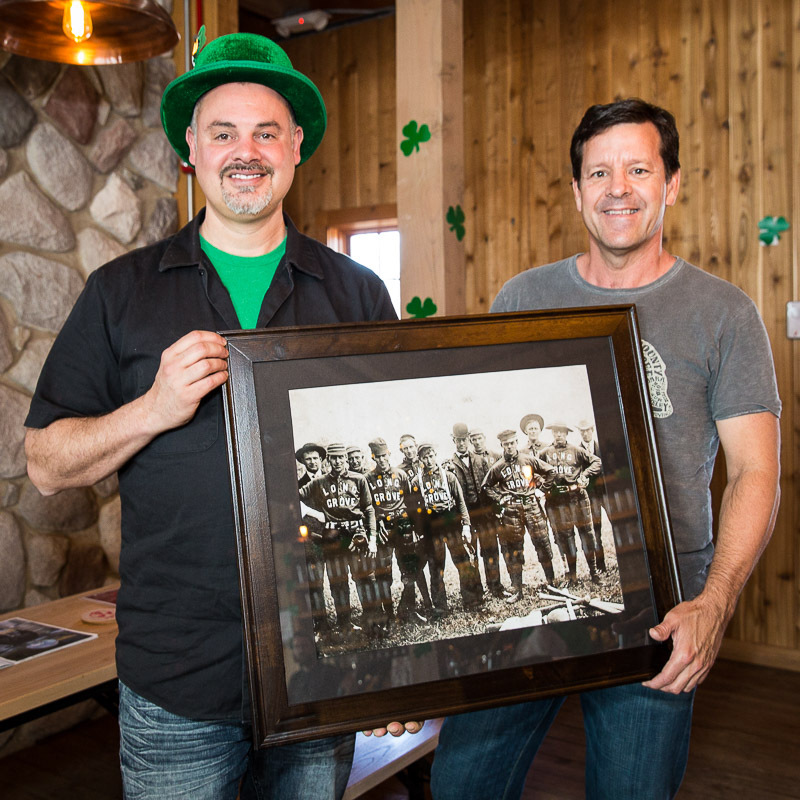 Celebrating St. Patrick’s Day at Buffalo Creek Brewing with owner Mike Marr (left) and local historian Aaron Underwood. Long Grove is a great place to celebrate your Irish heritage on St. Patrick’s Day. Whether it’s a trip to Paddy’s on the Square for beautiful Ireland-inspired gifts, green beer at the Village Tavern, Corned Beef at the Chatterbox, or a mint chocolate chip cone at the new Covered Bridge Creamery, our Village is a festive spot to gather for the holiday. This year features another new option as Buffalo Creek Brewing hosts a day-long St. Patrick’s Day Party, featuring free Green Eggs and Hash, a special price on their “Burning Red” craft beer, and evening entertainment. My husband Aaron and I stopped by the party this afternoon to congratulate Mike Marr, owner of Buffalo Creek Brewing and the newly installed President of the Historic Downtown Long Grove Business Association. In appreciation of his commitment of time and leadership to the downtown, (and being that he is a next-door neighbor to the farmhouse museum) the Historical Society presented Mike with a gift of a framed historical print of his choice. His selection, shown in the photo above, is of the Long Grove Crackerjacks baseball team, circa 1908. This was one of several “town ball” baseball teams that existed a century ago, with games played against other local teams such as Palatine and Lake Zurich. Mike likes to distinguish his craft beers with clever names, often a play on words or with a local significance. His newest creation is called “Muttersholtz,” the name originally given to Long Grove in the 1840’s by the early settlers who came here from the Alsace-Lorraine region in Germany. Maybe the picture will inspire a future craft beer that pairs well with baseball games and caramel corn? Mike also mentioned that he is starting his canning operation in the downstairs of the Brewery starting this coming Tuesday. Compared to bottles, cans have many advantages for beer, two of which are keeping out unnecessary light and oxygen. So not only will your favorite beers be crafted right here in downtown Long Grove, but they will soon be canned locally as well. However you choose to treat yourself, have a Happy St. Patrick’s Day! Long Grove entrepreneur Joanie Shunia (on the left) is pictured here with Long Grove resident, Gloria Jean. Once upon a time, Kaldi, an Ethiopian goat herder, noticed his goats dancing with unusual fervor after eating the red fruit of the coffee shrub. He tried some beans himself, and he too, had more pep in his step. He shared the discovery with some local monks and they tried boiling the bean and drinking the result, and then noticed they were unable to sleep that night. Coffee and humans have been intertwined ever since. America got its first commercial coffee roaster in 1793. Beans were hard to come by and expensive, so coffee was really only something for the wealthy elite. The advent of steamships improved the supply and quality and brought the price down to something most people could afford. After World War II, production in Central America boomed, and by the 1950’s, coffee was an everyday staple in homes throughout the country. Maybe you’re like me and remember coffee coming in those big red tins with name brands like Hills Brothers. While this was, no doubt, an efficient way of getting coffee consumed by the masses, it wasn’t the tastiest end product. By the late 1970’s, a space in the market was opening up for specialty and gourmet offerings. In our neck of the woods, there was a young enterprising mom from a gritty Chicago neighborhood, busy with her successful beauty parlor, but chasing her dream of a custom home. She had acquired a lot in Long Grove, and as her savings accumulated, the idea of opening a second business in the quaint little town of Long Grove became a passion. Back then, there were no available store fronts, and if you wanted a store, you had to grab one the moment someone decided to close up shop. The first one to come available for our young mom was the Coffee Bean. It was located across from Red Oaks in what had been a garage. The little shop sold antiques and coffee beans. The antiques were sold off and coffee beans and the trappings to grind and brew them became the sole focus. For variety, she started making her own flavored beans, which was unheard of at the time. She was on to something – people were buying it, and the word spread. Woodfield mall called asking for her to open a store. Then Northbrook court called. Then Randhurst mall. This was big. For legal purposes, Coffee Bean was too common a name, so the lawyer suggested the prefix it with their own name. Her husband Ed suggested Ed’s Coffee Bean, but the young mom’s middle name was Jean and that rhymed with bean, so Gloria Jean’s Coffee Bean it was. Over the next dozen years, well over a hundred stores opened around the country. 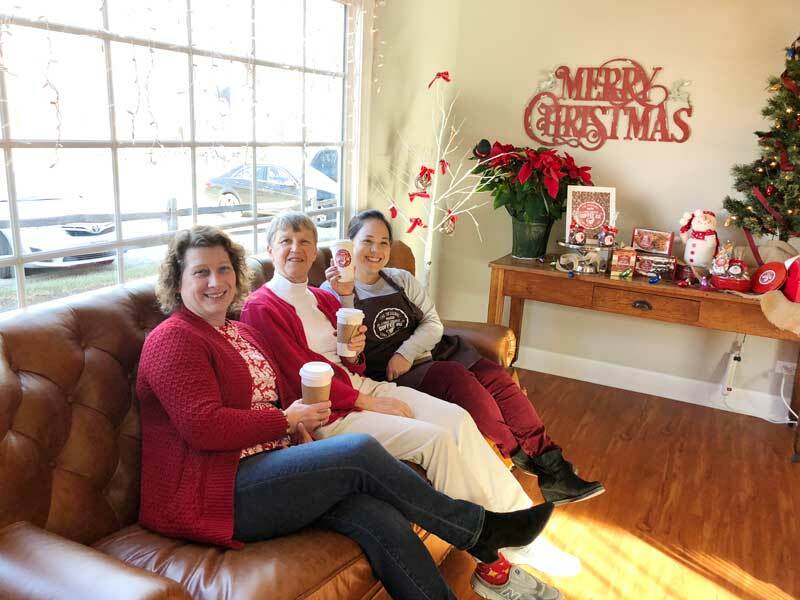 Long Groveresident Gloria Kvetko had turned Gloria Jean’s Coffee Bean into the most recognized coffee franchise in America. In 1993, an offer she couldn’t refuse for the company was put forth, and, somewhat reluctantly, she sold her coffee empire in 1993. The new owners eventually ran into difficulty, but the brand remained strong and positive, and today, under new owners yet again, it’s making a comeback. The little Long Grove garage that was store #1 was sold as well. The new owner Karen Krahn, renamed it Beans and Leaves. A couple of years ago the store was acquired by Ethel Berger. Ethel has recently started working with the Long Grove Confectionary to create a new coffee shop next to Towner Green, to be called The Long Grove Coffee Company. A new company is moving into the little garage that Ethel vacated and will offer coffee and ice cream. The name Covered Bridge Creamery will now adorn the little garage. Gloria Jean is happy to share her experiences and did so recently with a group of downtown merchants. 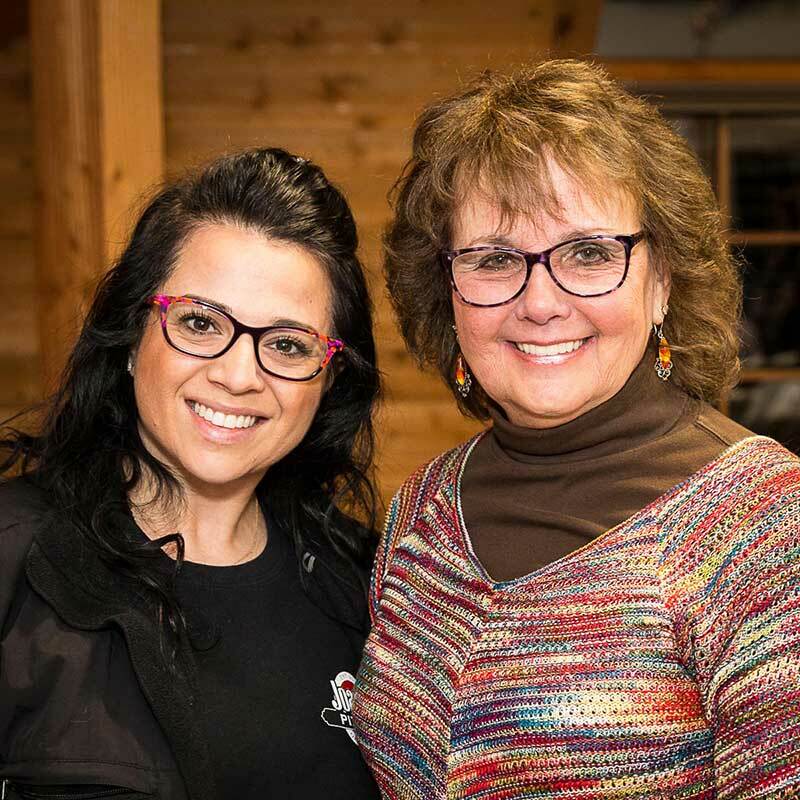 Pictured is Gloria Jean with one of Long Grove’s current female entrepreneurs, Joanie Shunia, of Joanie’s Pizza. While Joanie currently doesn’t have any national expansion plans, you never know. Perhaps you should grab a slice now, so you’ll have bragging rights if Joanie’s Pizza ever becomes the household word that Gloria Jean’s Coffee Bean did. 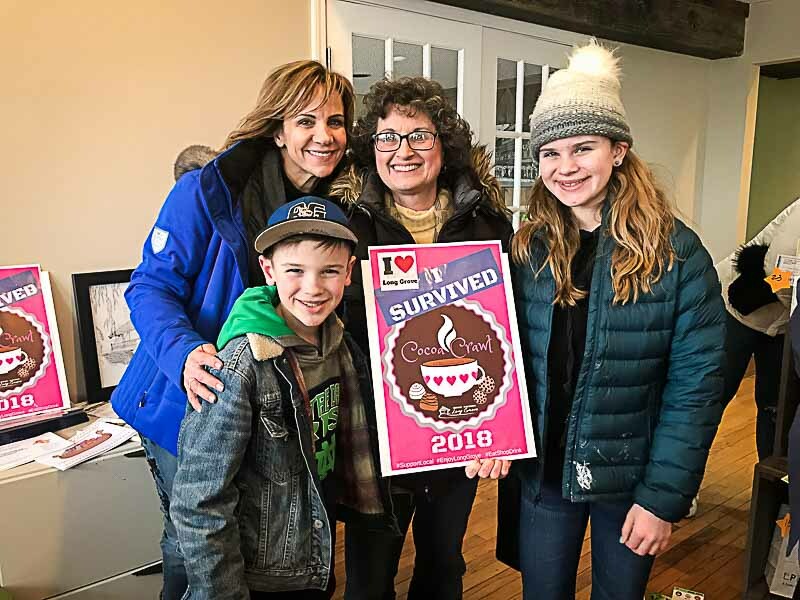 Long Grove residents (L to R): Miles Tyer, Kristen Wojicik, Pam Pasminski, and Katie Tyer are all smiles after completing the Cocoa Crawl held in downtown Long Grove on February 3rd. Like most of Long Grove, I’m taking a “snow day” today by staying inside and off the roads so that the snowplows can dig us out before the next predicted wave of snow hits later this evening. And while a herd of deer are obviously having fun cavorting through the snow drifts in my back yard, I’m choosing to stay indoors and enjoying a cup of hot chocolate while blogging and reading. It’s the perfect opportunity to tell you about the Cocoa Crawl. 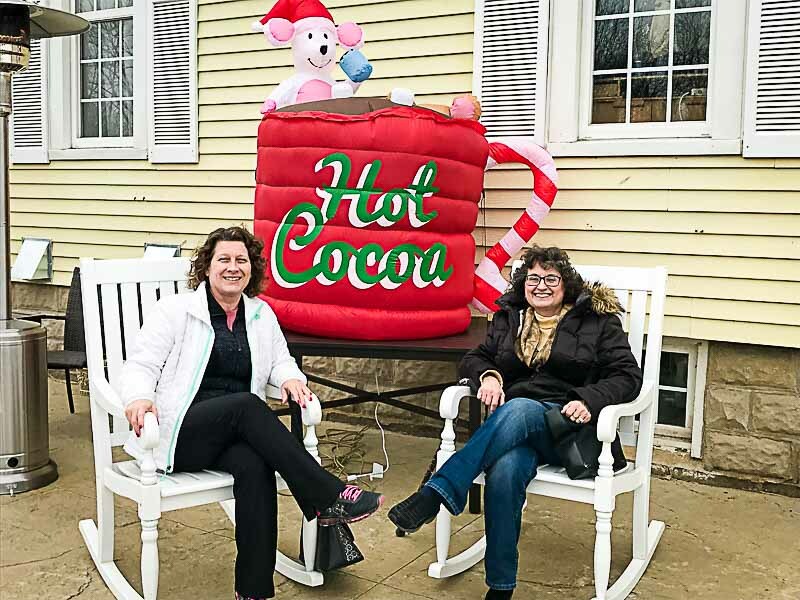 Held last Saturday, February 3rd, the Cocoa Crawl was a new idea initiated by the Historic Long Grove Downtown Business Association. 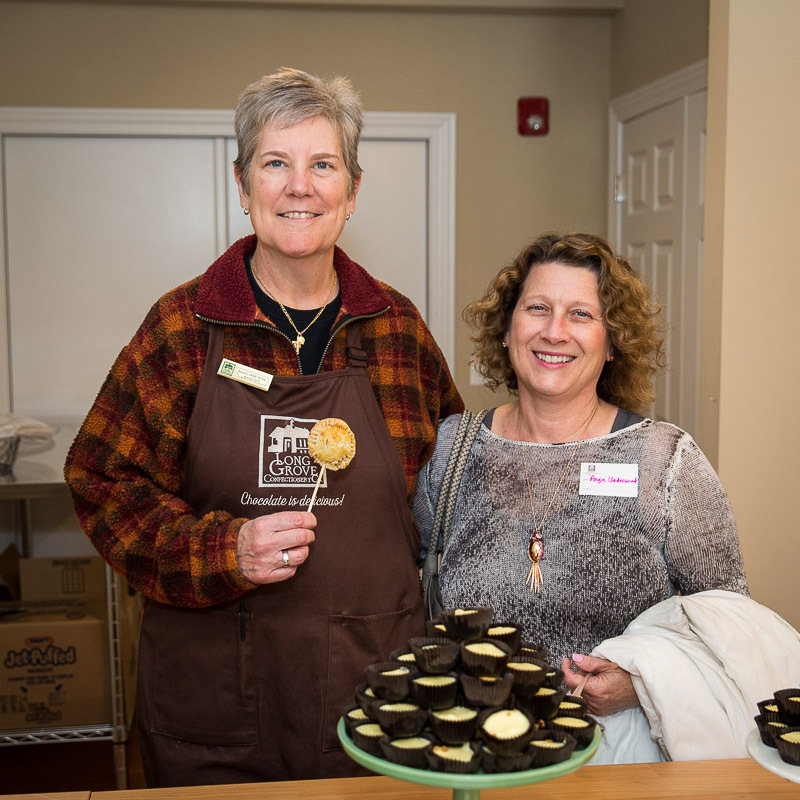 On a typically slow winter weekend, residents and visitors were encouraged to come to our village crossroads and explore all the unique shops, restaurants and businesses with the enticement of free chocolate flavored samples at each location. Who does not love free chocolate? Apparently no one, because the event was a hit and downtown Long Grove was literally crawling with hundreds of families out to enjoy the treats, snacks and hometown ambiance. 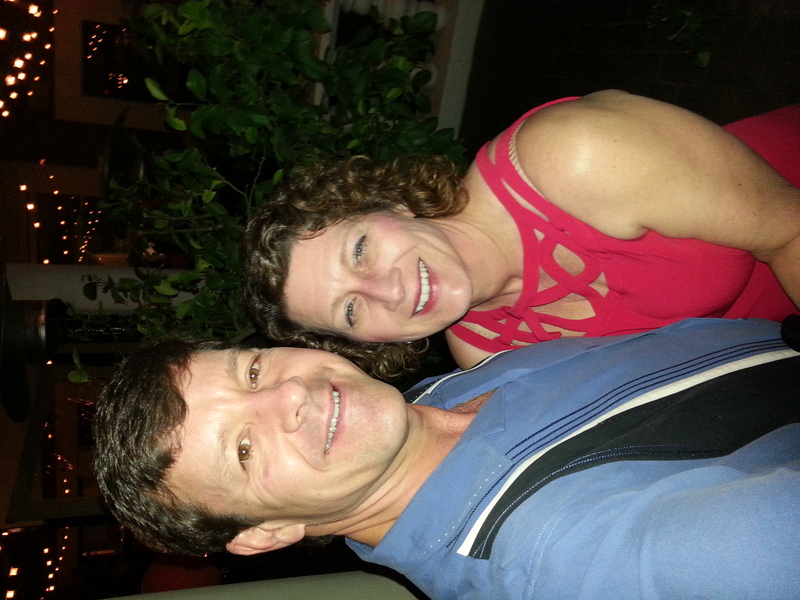 My friend Pam and I had a great time catching up with friends and neighbors that we haven’t seen for months as we hibernate our way through the winter season. Here are just a few of the goodies we enjoyed: Chocolate Macroons at Within Reach, Hot Chocolate Popcorn at Signature Popcorn, Chocolate Balsamic Vinegar at The Olive Tap, Chocolate Pudding cups topped with Baileys Irish Cream at Unwined, and Hot Chocolate Bark at the Long Grove Confectionery. We would have had more but mercifully (for our diets) some of the locations had run out of samples by the time we got there due to the large number of attendees to this inaugural event. At the end of our afternoon we stopped back to register for the raffle prize drawing, with 20 of the local businesses donating gift baskets or gift certificates to the festivities. It was great to see so many people enjoying our downtown and becoming acquainted with the newly renovated and opened shops. A tip of my snowman shaped cocoa mug to you, downtown merchants, for an inspired idea! Taking a break from our crawling, Pam and I enjoyed a short rest under the “chocolate hot tub” outside of the Long Grove Coffee Company. The namesake mural at the new Covered Bridge Creamery provided the perfect backdrop for our Historical Society committee meeting this week. After spending the first several weeks of 2018 in a warmer climate, it was a pleasant surprise for me to return to Long Grove and find two new businesses in our historic downtown. I’m very excited to be able to feature one of them today, Covered Bridge Creamery. Located in the former location of Beans & Leaves (on Old McHenry Road next to the Chatterbox), this new shop offers a variety of premium ice cream flavors as well as coffee, tea and assorted pastries. New counters and seating complement the classic wood paneling with the addition of a giant mural showcasing our beloved and iconic covered bridge. It provided the perfect spot and perfect inspiration for our recent Covered Bridge Preservation Committee meeting. Our group enjoyed the ambiance and the delicious lattes while also getting some advocacy work underway. Business owner Eric Wallor was gracious enough to sit with us and tell us a bit about his new venture. 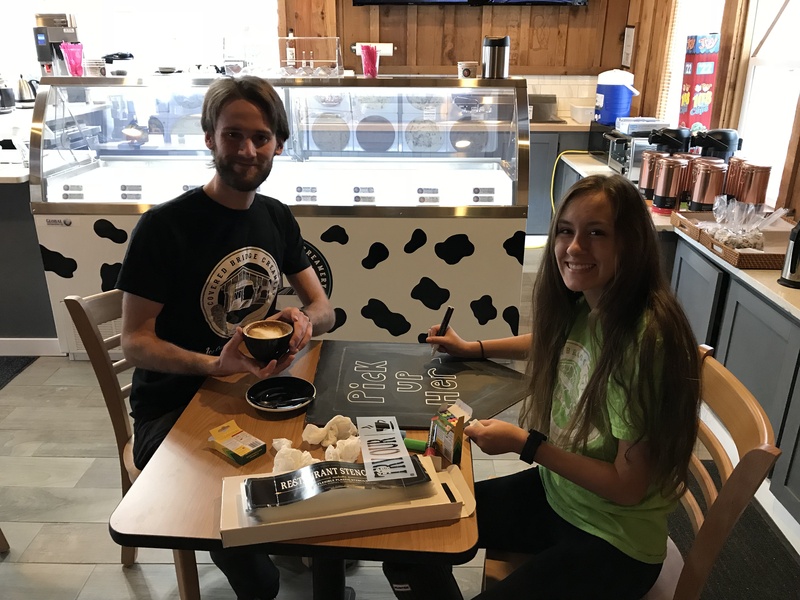 Manager Nicholas Modlin and crew member Rachel Temple are two of several employees waiting to make your experience great at Covered Bridge Creamery. Eric, along with his sister, brother in law and another partner first came to Long Grove this past summer to open Signature Popcorn, which is located next door to the new Creamery. Signature Popcorn started as an online business three years ago, and when the opportunity for a storefront in Long Grove became available they jumped at the chance to add a brick and mortar store to the expanding business. 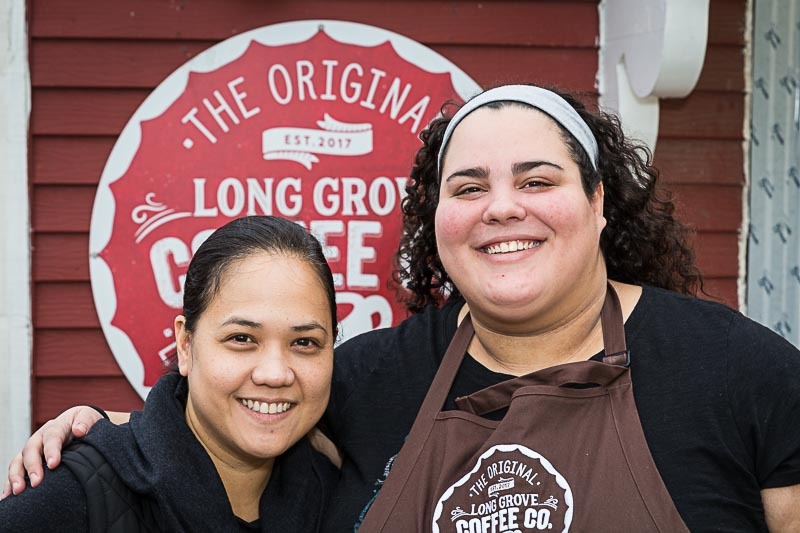 They were very attracted to the history and potential Long Grove provided, so much so that they now own two businesses and are very optimistic about the future of our town. Excited to, “bring our passion for ice cream, coffee and tea and our concept for Covered Bridge Creamery,” to Long Grove, Eric is definitely filling a need. One request that I repeatedly heard from residents during my term as Village President was to bring back a spot to get ice cream treats in our downtown. Thanks to Eric and his team, your wish is now reality. While I can vouch for the tasty hot beverages, I will be returning soon to sample the sweet stuff. Covered Bridge Creamery is open currently, M-F 6:30 am to 4:30 pm, Saturdays 8:00 am to 4:30 pm and Sundays 9:00 am to 4:30 pm. As the days get longer and the weather gets warmer, they will eventually be open later into the evening hours. Stop by and check it out!